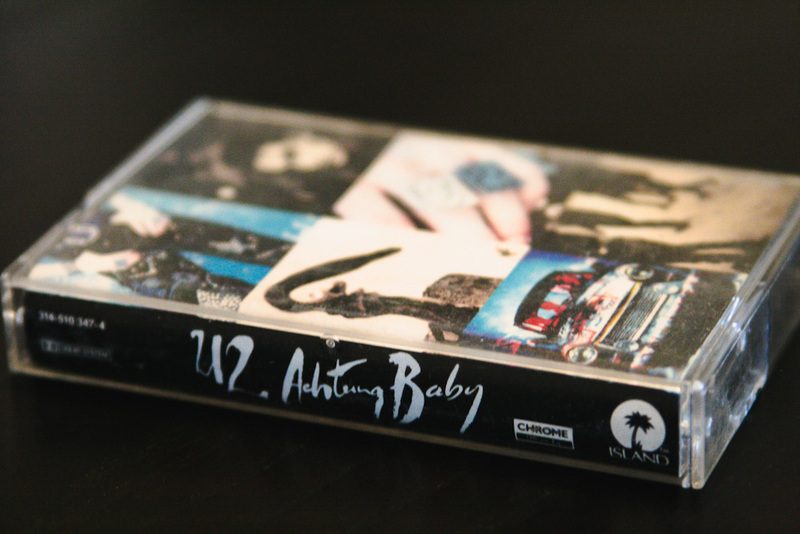 Twenty years ago today, on Nov. 19, 1991, Achtung Baby was released. It was my U2 entry point. I knew a few earlier songs from radio play — mostly The Joshua Tree hits of “With or Without You” and “I Still Haven’t Found What I’m Looking For” — but U2 was not yet Beth’s Favorite Band. Until late 1991, early 1992. I was 12 going on 13. These were formative years, for the band and for me. A boy I had a crush on was walking in our apartment complex singing “Mysterious Ways,” a song I recognized from the radio. I had no previous knowledge of U2. I know now what a momentous work the album was. But then, I didn’t know its significance — that it was a rebirth, a reinvention and re-envisioning of a band. 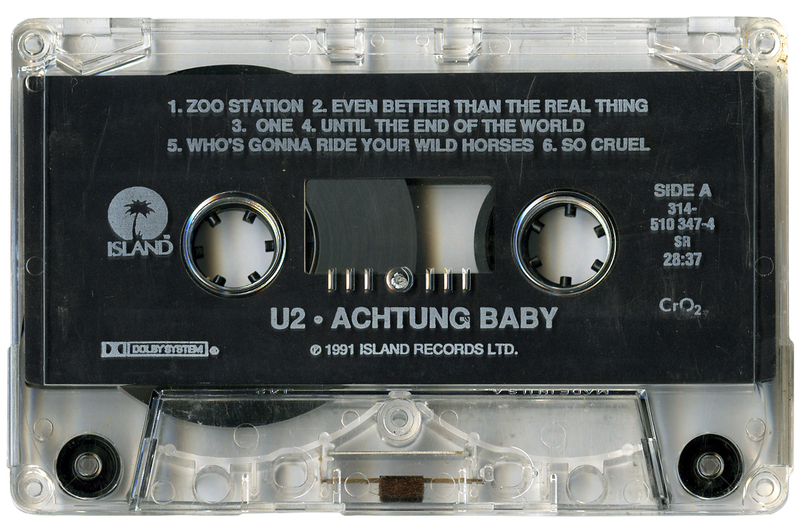 I just knew I couldn’t get enough of the heady sights and sounds of Achtung Baby. They didn’t put their name or title on the cover; that automatically equaled cool. And my headphones did strange and wonderful things on the first song when I popped the tape in my Sony Walkman, as industrial “Zoo Station” noises bounced from right to left to right again, and sounds played that I didn’t even know were sounds. There was the whisper of a naked woman on the front cover and a figure of a naked man on an inside panel (a symbolic Eve and a literal Adam). There were photos of men in drag and in other foreign places. I didn’t even know how to say the name of the album — my ever-smarter older brother informed me: “Ahk-toong. It’s a warning in German. ‘Watch out, baby.’ Or ‘Look, baby. '” And they spelled “’cause” as “cos” in the lyrics. It was so exotic and European and mysterious. It was so cool — something I wasn’t at that age, and still am not. But it made “cool” accessible to me. And then there was the music. It was light and dark, deep and shallow, all at the same time. At some point, every track has been my favorite on the album; to this day, I still can’t pick. “Mysterious Ways” became so familiar after hours of radio and MTV play. The video hypnotized me: the swirling, twirling images of a faraway city, the lead singer’s distorted silhouette, the kaleidoscope colors, the bellydancer. 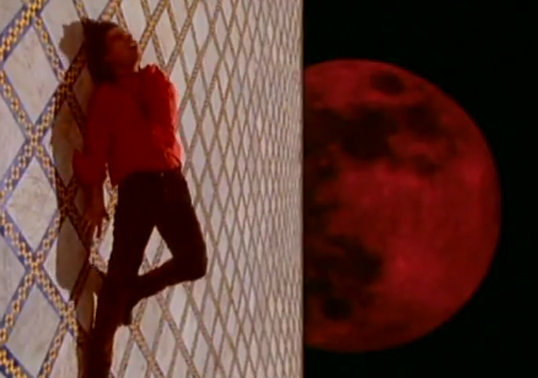 I memorized this image of Bono from the video, and still see it every time I hear the song. “Who’s Gonna Ride Your Wild Horses” was probably my first true favorite from the album. The music was dramatic and the lyrics were melodramatic, as I certainly could be at that age. 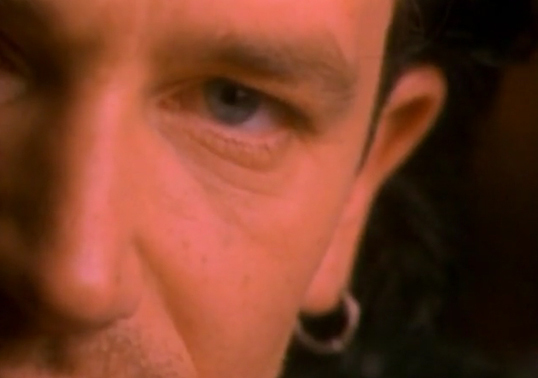 The black and white video showed us a still-vulnerable Bono, not yet completely masked by the Fly shades. There was lots of eye contact and black leather as he perfected his signature stop-lip-syncing-the-words-even-as-the-music-continues move (or the famous “you say” moment from “One”). I remember scribbling lyrics on my book covers in high school: A woman needs a man like a fish needs a bicycle, from “Tryin’ to Throw Your Arms Around the World.” A pesky boy in my freshman Biology class who liked to pull my metaphorical pigtails would cross out “bicycle” and replace it with “water.” But Achtung Baby was my earliest source of girl power. 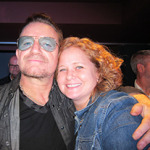 Bono idolizes woman, puts her on a pedestal, suffers at her feet. He is tormented by her, but always reverential of her. These were good lessons for a 13-year-old girl. They’re good lessons for a 30-something girl. “So Cruel” was a comfort as I started to move beyond crushes and fall in and out of love with boys. The trio of “Ultraviolet,” “Acrobat” and “Love Is Blindness” became this beautiful black hole at the end of the album that was just immense enough to accomodate my growing teenage angst. Don’t let the bastards grind you down. “Zoo Station” and “Until the End of the World” offered more adult sounds and ideas as I headed off to college and needed a new soundtrack. “Even Better Than The Real Thing” wouldn’t become my favorite until 2011, when it started launching the 360 shows, though in it Bono sings my all-time favorite lyric: Give me one last dance, we’ll slide down the surface of things. “The Fly” also had a recent renaissance in my world, thanks to the 360 shows. When I hear it now, it evokes the image of Bono, Edge and Adam all gathered around Larry’s drum kit playing for each other, as I imagine they did in the early days in Larry’s parents’ kitchen, and not for the crowd of 70,000 watching. Now I’m 32, but still going on 13, as this album moves me the way it did then. It is the perfect album to me. It’s the album I play start to finish, and over again. It is the album I take to the deserted island. I know a lot more about it now. I know it was U2’s salvation, not in terms of critical and commercial success, but in terms of the band’s existence. I could write a dissertation on this album, and may someday. But for now, I just want to wish it a happy birthday, and thank U2 for daring to risk it all to make it. OMG,Beth…I love it!! It’s like you live inside my head sometimes! Maybe we also share a soul…. When you mention the boy you had the crush on… I couldn’t help but think of how THAT is the way I discovered U2, more or less. It was a few years earlier, but nonetheless. It was the fall of 1987 (I think?–I’m sure you’d be able to correct my dates). Our youth group (I was in 8th grade) was making a Haunted House in my Catholic school. A boy, TJ, was playing Rattle and Hum on the boom box (but they weren’t called boom boxes then). I heard Bono sing “Love rescue meeeee” I said is that “Bone-O?” TJ, the good fan, quickly scolded me and said “BONO! !” I haven’t stopped listening to them, obsessively, since. So, I find it reassuring that I’m not the only fan that found them because of a crush on a boy. And, being that I am 6 years older I experienced the black hole of UltraViolet, Acrobat, and Love is Blindness while sitting under my loft bed in my dorm room at (sigh) Penn State. At this point, TJ was a long, distant memory (and he never even knew about the crush or how he made me (well, helped) me fall so in love with four other men.) But don’t worry, he was replaced by another boy- no a “college boy”- named Michael. And HE sat with me, with the black light on and the lava lamp oozing and fell in that black hole with me. And, I sat in that black hole without him. It’s a deeper, darker hole alone. You crack me up, D. I’m grateful they had to dumb it down for the dopey dopes and released the “Isn’t Bono pretty?” version of “One.” I fell hard. And the boy has no idea what he launched, and probably doesn’t even remember who I am. I like to think I still would have found my way to them, but it’s strange to think about my life having a different soundtrack.